Then I noticed the huge hint in 28ac’s, Maybe propose for a prime minister before entering Number 10 shortly (8). Some may have fallen for the trap thinking this was actually, Maybe propose for a prize minister before entering Number 10 shortly (8), with the single misprint and the answer being NOMINATE – MIN A in NO TE(n). Actually it was a hint, via ex-Prime Minister BLAIR. BLAIR is clearly a charade of B( for Black) and LAIR (for Hole). Thus BLACK HOLE, in some fanciful manner. Simple. At least, that’s how I solved it. We were delighted to find such a short preamble with no mention of jumbles. 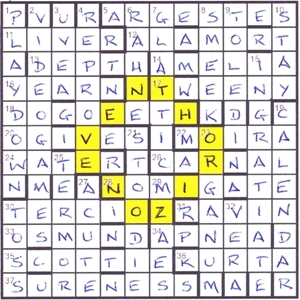 Nineteen clues with misprints whose correct letters spell out a hint – and some clashes where we have to select the correct letters that will reveal what escapes from a boundary. We wonder about Devil’s Island or Alcatraz then set to work. I don’t have to read far to confirm that Verbascum has his right of entry to the Listener Oenophile Outfit when his clue 14 reads ‘Not waving arms about, I’m fuddled with ale (6)’. A(bout) + I’M + ALE (fuddled) gives us AMELIA so we decide that there is a misprint there for not Having arms. Fuddled with ale! Oh dear, but ‘Cheers, anyway, Verbascum. Those corrected misprints were really helpful and the other Numpty was very much on home ground so that when we had realized that ‘Pitched ocean around Greece, from the east win in lilt of Milton’s (8)’ gave us ARGESTES and an S corrected misprint (liLt to liSt) and he saw SCHWARZSCHILD, all was clear. ‘Schwarzschild radius’ he announced. He traced out the EVENT HORIZON and that told us that HAWKING RADIATION had to be escaping. Those words not only neatly circled the EVENT HORIZON but they also conveniently resolved our remaining doubts about words and completed our grid. We were left wondering why Queen Victoria’s hoRse would be called REPROVE since we needed an R corrected misprint there but Chambers tells us that ‘rouse on’ means REPROVE for a different Victoria. Most enjoyable, thank you, Verbascum. If you don’t recall having solved a puzzle by Verbascum, that’s not surprising. His last was over 5 years ago in January 2013 with its Carolus Linnaeus/Isaac Newton/Binomial theme. This week, we had a boundary and some clashes with a message providing a hint. As it turned out, this was a fairly gentle and straightforward solve with Schwarzschild radius coming out of the extra letters. I vaguely remember having heard of it, although I couldn’t remember exactly what it was. Googling prompted me with a black hole reference, and from there it didn’t take long to see EVENT HORIZON around the centre of the grid. All that was left was to resolve the clashes which revealed what came out of it. The first thing I noticed was a possible TION to the north-west of the “horizon”. Working my way back I was able to deduce RADIATION and then HAWKING, and I definitely hadn’t heard of Hawking Radiation. Slightly back-to-front logic, but I got there without further googling. Thanks for an enjoyable solve, Verbascum. Will I have to wait another five years for your next? I have known and liked the Bach Cantata BWV 208 — “Sheep may safely graze” — for quite a while. Then it suddenly occurred to me that it could make a Listener theme. My first decision was the size and shape of the grid. I wanted to somehow show sheep being ‘protected’ by shepherds and shepherdesses. After several tries it became apparent that a circular grid would best portray the theme. It was also serendipitous that the original German title — “Schafe konnen sicher weiden” — was four words each of six letters. Having never set a crossword with a circular grid before I had to start from first principles. Obviously the required protection for the sheep would come from an outer cordon of shepherd(esse)s. This proved to be more difficult than I had envisaged. I immediately thought of Gabriel Oak in “Far from the madding crowd” and supposed that there would be numerous others around. However, it soon became apparent that there are not that many shepherd(esse)s in literature! Hence I had to resort to more obscure characters. I had decided that Ring 5 should contain the German title. Therefore I needed to show the recipients of the protection in Ring 3. I managed to get a reasonable list of “sheep” to juggle into the ring. For a bit of humour I included Dolly and wanted to include Shaun as well but could not fit him in. I liked the inclusion of a wolf “in sheep’s clothing” suitably exposed. With three of the six rings being thematic this gave me many problems finding real words reading inward or outward. I also wanted one answer in each quadrant to be of seven letters to extend into the centre circle and spell BACH. Some jumbles were obviously going to be necessary but I tried to limit them as much as possible. I decided that it might help the solver if no two adjacent answers were entered in the same way. The outcome was, I felt, a difficult puzzle but basically fair. I am aware that some solvers did not like the jumbles or the ‘obscurity’ of one or more shepherd(ess). If I could have found a way to further reduce or even eliminate these I would have been delighted to do so but the constraints of the puzzle did not allow this. With hindsight I think that I should have indicated in the preamble that the outer ring started at radial 1 and perhaps also given the length of the names of the individual characters. Nevertheless, I hope that Cordon did give some enjoyment to a few solvers. But this puzzle was hard! MOPSA or MOUSA? DELIO or DELIS? Decisions, decisions! More about that later. I loved the mixture of JS Bach and his “Schafe konnen sicher weiden” (Sheep may safely graze) in Ring 5, with the Sheep themselves at Ring 3 and a Ring of largely obscure Shepherds ‘protecting them’ around the edge at Ring 1. Very neat. And with a wolf thrown in amongst them (the sheep, that is), too. The animals were largely sheep: AMMON, MOUFFLON, DOLLY, SOAY, SOUTHDOWN, MERINO and one WOLF. Aside: were they interspersed with the characters ‘or musik’? Not sure. If you had to pick and nothing else to go on, what would you do? What did you do? I decided MOUSA really was too obscure, so went with MOPSA. That one was easy! I’ve clearly missed something – but I’ve no idea what!